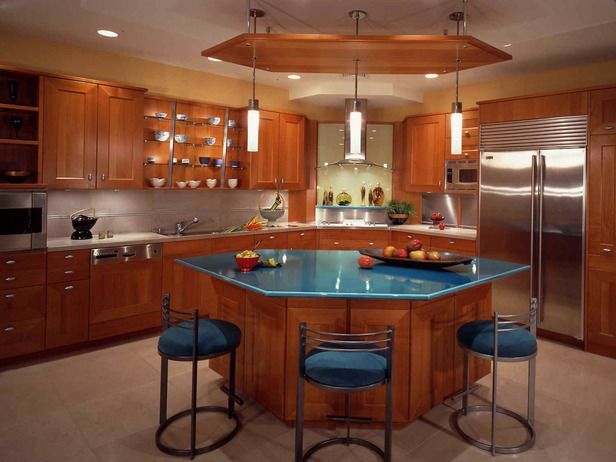 How you use your kitchen will determine the kitchen islands for you. What is it that you need more of? Is it purely storage that you want, or more seating is a priority? Do you have a requirement for an extra kitchen sink or for the one kitchen sink you have to be in a central location away from where you stand to prepare food? Decide what you want most out of your kitchen island and make it the number 1 priority. It is easy to get side tracked by design and visual appeal and end up with a beautiful kitchen island that doesn't meet your original requirements. Set your priorities and stick with them. Kitchen islands do not need to be only square or rectangle. Stunning designs for rectangular kitchens can include many shapes, like this 6 sided one. Whatever design you prefer, make sure it meets the needs of how you function in the kitchen. A properly thought out design will assist your work flow, not be this huge thing in the way. Design it to have the deep sink you need and the type of stone that can take you cutting on it! Put the drawers on the side you would reach to first (nearest the stove maybe?). Is it extra outlets you really want? Where would they fit in and make your life easier? Make sure the things you will need access to aren't blocked by someone's chair. Ask Questions when in the design phase! Think beyond the square, flat, one level. Will the need You have be better suited with a multi-tier kitchen island? Will a curved surface resonate with your personal style better? Think open spaces, alcoves and other types of kitchen island designs. To set off a kitchen think: complimenting colors and light. Exact match counters and exact match cabinet color is not going to make most kitchens Really pop. Even a slight change can make all the difference. 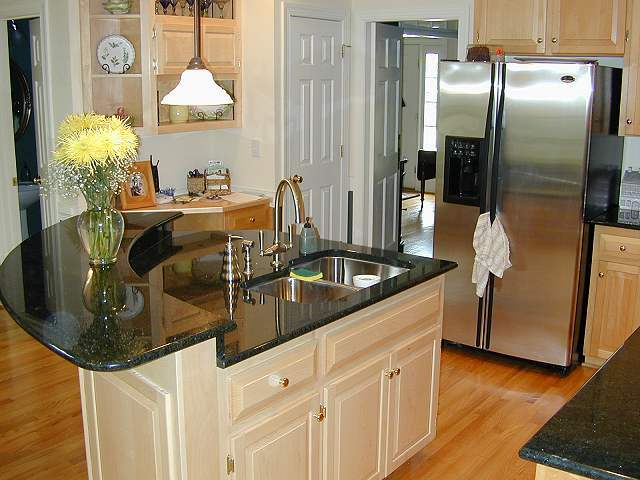 A shade lighter or darker for the counter top or only on the the cabinets is a safe idea. Or go bold and make it entirely different and complimentary! Whatever you do, do not forget the lighting. Kitchen Island lighting really will tie everything together.